Happy Valentine’s Day ya’ll! Now that I’m finally back from New York fashion week, I’m totally wiped out. Instead of flowers and romance today, I’ll be dealing with laundry, errands and catching up on some work. I leave for Austin on Wednesday and Carmel the following Monday, and I have a lot to do before I head out! I think I’ll have spent a total of 10 days in Dallas the whole month of February. Traveling is certainly fun and exciting, but it makes everything just a bit more hectic, don’t you think? It’s hard to be away from your home base for so long. When I head back to Austin, it means I’ll have to return this gorgeous coat to it’s rightful owner (my sister). I wore it practically every day while in NYC. The fur sleeves make just the right statement without being too overly dramatic, and the classic trench fit works with every outfit. You can’t really see my dress, but it’s the same one I wore in this post awhile back. It was perfect for the freezing temps since it’s long-sleeved and very thick fabric. The one mistake I made was not bringing any earmuffs or gloves – what is wrong with me? Luckily I was able to borrow this pretty pair from my friend Patti. Don’t they look perfect with my coat and furry Fendis? They’re real rabbit fur and only $60, which I think is pretty rad. The sleeves on your coat are amazing, you look amazing in all black. So chic! Love a pretty black outfit for NYC! Chic blackout! Such a classy look, and I love your hair like that. Beautiful. Can we all shop in your sisters closet? She has excellent taste! Happy Valentine’s Day! Hope you get some much needed rest. Love this all black look! That Chanel bag is gorgeous! Those fury Fendi’s are amazing!Glad you made it out safely before the next storm arrived! Love that you mixed up an all black look with different textures. 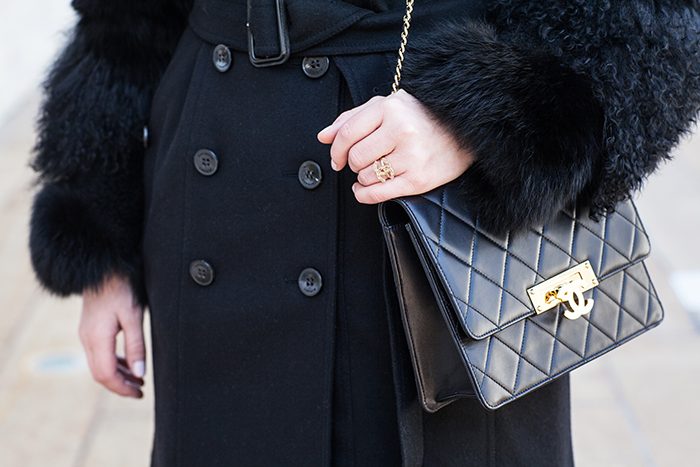 A great coat is so necessary for this crazy winter we’ve been having. Hope you had a great time at NYFW! 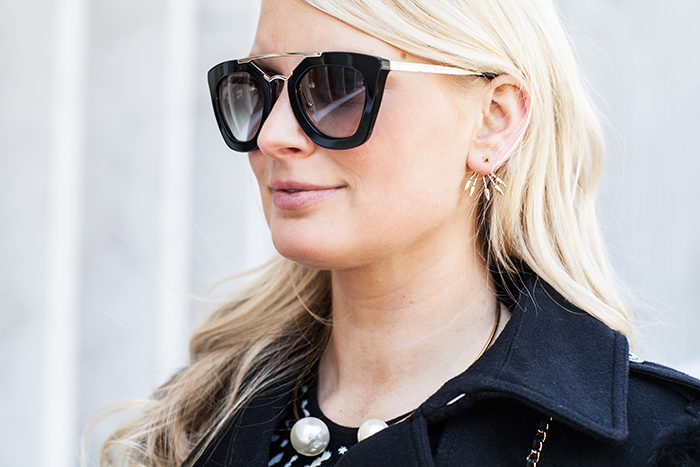 I desperately need those sunnies!!!! Loving this entire look! Loved seeing you this week! So chic Merritt! You look fabulous fabulous fabulous!!!! This look may win the award for “Warmest Outfit at NYFW”. And of course, all black is always a winner! Love the coat (and the bag!) and would love to grab coffee sometime when you’re in Austin. Hope you get some time to rest up this weekend! SO CHIC! the coat and the shoes are absolutely fantastic merritt. ooh I love this! Totally forgot to mention this earlier, but my mom saw that dress on you awhile ago (when you first posted it) and she got it and LOVES it! Kinda jealous she got it and I didn’t though! Absolutely gorgeous look! You make staying warm very stylish! ooooh you’re coming to my neck of the woods soon! I’m loving the fur details in your outfit! Muffs, sleeves and shoes—obsessed. I tried on the monster earmuffs & must agree they are so warm and cozy! this outfit is royal !! Love your all black everything! The coat and shoes are amaze-balls! Obsessed with this whole look, esp. the shoes! Always perfect, Merritt!